The Inca were a small highland culture who established their rule in the valley of Cuzco, Peru, around 1100 CE. The city of Cuzco was their capital, and by 1350, they had extended their rule to all of the areas close to Lake Titicaca in the south as well as the valleys immediately east of Cuzco. They also controlled northward to the upper Urumbamba River. By 1450, their empire stretched from Quito in present-day Ecuador to central Chile, a territory of 3,000 miles. Cuzco was always a center of artistic production during the Inca empire. After the Spanish conquest (c1531–1532), Spanish artists who arrived in the Viceroyalty of Peru taught their techniques to native artists. Within fifty years of the conquest, native artists had mastered European styles, techniques, and compositions and were producing portraits, religious, and narrative works. The Inca before the conquest had no portrait painting comparable to the European tradition. They appropriated it to portray their ancestors and honor their independent past. Throughout the colonial period, portraits of Inca rulers in the European style were prized by colonial aboriginal nobility as evidence of their aristocratic forebearers. This portrait of Tupac Yupanqui is probably based on a series of works executed in the 1570s as a gift to King Phillip II of Spain. The series was reissued in oil between 1726 and 1730. 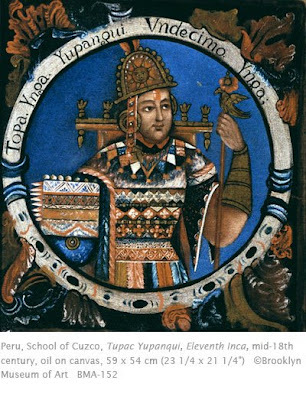 Tupac Yupanqui ruled the Inca between 1471 and 1493, and was the son of Pachacutec. He led the conquest of the Chimú Empire in 1470, and doubled the size of the Inca Empire. While the portrait bears all the hallmarks of the Spanish Baroque style, the native artist was careful to include all of the symbols of ritual regalia that marked the Inca rulers. After a series of rebellions by Peruvian natives in the late 18th century, the confidence of the Spanish invaders was shaken. Inca portraits such as this were forbidden and many destroyed. Some series were hidden, and this portrait may come from one of those. When Peru gained independence from Spain in the nineteenth century (1821), the Inca portraits again enjoyed popularity, especially among travelers to Peru, another way the portraits left the country. Very interesting post; had no idea about this era of Incan art. Thanks.